Tethered rides almost always are conducted at special event programs. If you simply would like to experience the excitement of a five-minute tethered ride, the most common place you may find a tethered balloon would be at a nearby hot air balloon festival. However, Liberty Balloon Company also contracts equipment and services to provide tethers throughout the year for various events, including corporate promotions, at school assembly programs, media events, Bar-Mitzvah and Bat-Mitzvah celebrations, graduations, weddings, member appreciation events, and other private parties, including group tours. Based just outside Rochester, in the Finger Lakes region of upstate New York, Liberty Balloon Company’s primary flying area is located between Niagara Falls and New York City. We are a mobile business however, and will travel for events most anywhere in the world. 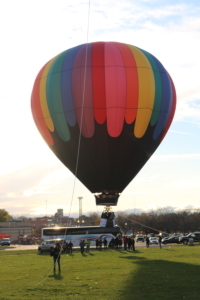 The ride itself lasts approximately 5 minutes, and each of our balloons can carry 3 or 4 passengers besides the pilot. This means that in a 2-hour period, we may be able to give nearly 100 people rides, per balloon–assuming the wind and weather cooperate! 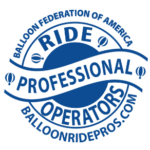 Since the wind and weather requirements for a successful tether are even more stringent than for a normal flight, and because of the nature of the work, many balloonists choose not to make tethering part of their ride offerings. 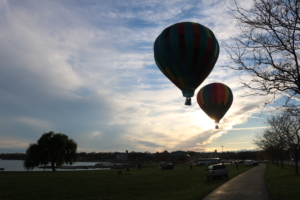 Liberty Balloon Company, however, specializes in tethers and special event programs. 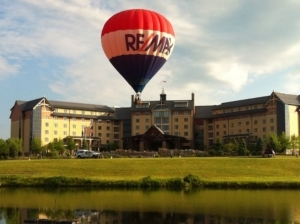 Since 1991 we have managed the hot air balloon program for Re/Max of New York, for which a majority of scheduled events involve some variation of a tethered balloon. 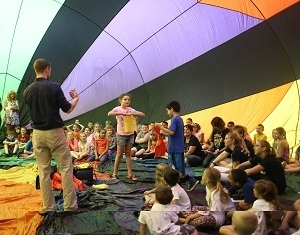 Additionally, we have been giving balloon assembly programs at elementary schools for over 20 years. Most often, these programs include a tethered hot air balloon in their program. Our tethering expertise is hard to match! …Anything that will attract media! Liberty Balloon Company operates under the assumption we will complete our obligation to the end, regardless of weather conditions. However, we will give consultation on weather, and if at any point you as the organizer of the event decide to abort–because of wind, weather, or otherwise–we will do as advised, and you will only incur the expense for those services performed: nothing more. Timing: we only schedule for events within 2-4 hours of sunrise or sunset. A tether event during the middle of the day has a success rate of between 1 and 2 percent. When scheduled during the proper time frame, however, the probability for success is far higher! Schedule a HORSE AND CARRIAGE ride as a backup. Works especially well for a wedding or marriage proposal. Buy in blocks: When scheduled at the proper time — typically within 2-4 hours of sunrise or sunset — success rate of a flight is roughly 50%, and of an inflation roughly 75%. We offer block discounts when you schedule a minimum of five tether events in one season. This works especially well for a branding or marketing campaign. Call us for details! When properly managed, a tethered balloon at your event makes you stand far above the rest. It is impossible to match the excitement generated by a hot air balloon in person! When it comes to rented balloons for tether events, Liberty Balloon Company will help you manage the risk so you maximize both your budget and also your chances for the perfect tethered ride experience.